Beautiful and dramatic in an entry or living area, this rectangular wall mirror is a true statement piece. Inject wonderful elegance in any decor with this rectangular wall mirror from the Uttermost Lane Mirror collection. A versatile design that can be hung vertically or horizontally, this mirror features a stacked design with a beveled edge. Subtle silver finishing is a perfect complement to the eye-catching but minimalist appeal of this delightful mirror. 30" wide x 40" high x 2" deep. Hang weight is 42 lbs. Raised inner section is 19 3/4" wide x 29 3/4" high x 1 1/4" deep. Surrounding frame is 1/4" wide. 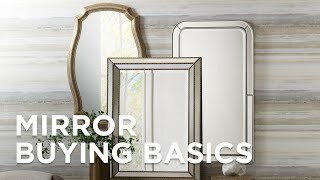 Rectangular wall mirror from the Uttermost Lane Mirror collection. Silver finish. MDF wood frame construction. Beveled mirror edge. Does this mirror come in a smaller size? BEST ANSWER: I am sorry - there are no other size options available for this collection. Perfect for a spacious bathroomthis 1x/5x LED makeup mirror is wall mounted. The polished brass finish ceiling-mount kit with this beautiful rectangular mirror will complement any style of room decor. Gatco Elegant Satin Nickel 9 3/4" x 12"
Satin nickel finish gives a soft glow to this beautiful stainless premium metal rectangular table mirror.